It’s been a productive few days. The paper pieced blocks for GVQC’s quilt are completed and a beaded tatted motif was finished. It will be put on Gerry’s block and when I finish the seam treatments, I’ll take a photo and put it on the blog. My hand knitted sweater is also coming along well. A mini free standing lace experiment was completed also. I sewed the same motifs using different stabilizers – 2 layers of Solvy and 2 layers of Rinseaway were used to sew out a free lace design from Zundt. I had used 2 layers of the Rinseaway for another project, and should have read the instructions and used one layer for the lace motifs. The Rinseaway motif was in water for close to 72 hours. I picked at it with tweezers, changed the water at least 20 times a day and everytime I washed my hands, I washed the motif too. As you can see in the picture, the Rinsewaway paper didn’t want to dissolve. It is a wonderfully soft piece of lace, but it’s hard to see the lace design. I should probably try it again, using one layer, but I really don’t like the fuzzy edges. 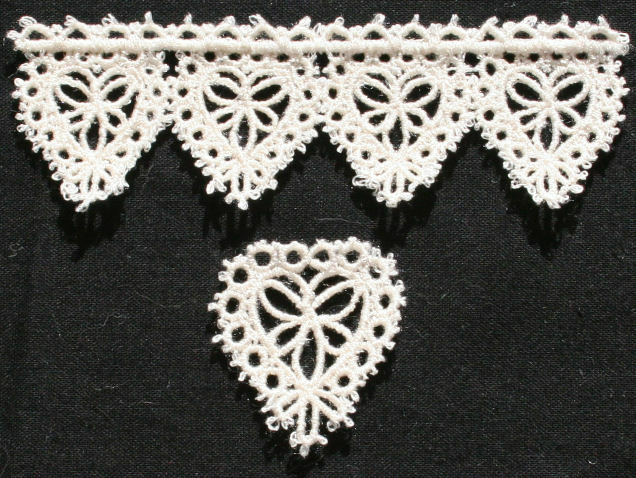 The motif that used 2 layers of Solvy really showcases the lace design. It soaked in water overnight. It isn’t nice and soft like the Rinseaway motif though. The conclusion? Each stabilizer has good points and bad. Each stabilizer is best suited for a specific project. I will continue using the Solvy for free standing lace designs and I will also use the Rinseaway for embroidering on wearable items. The drape and softness of the embroidery is wonderful, and I really didn’t give it a fair shot by using 2 layers instead of one. The past 3 days have been mega fiber frustrating for me. Friday night I tried shuttle tatting again – this time with a beginner book. The center was made with no problem, but then I could not figure out how to add the chains for the next rows. Stubborn head that I am, I tried all sorts of variations till the wee hours of the morning, then picked it right back up again Saturday – with nothing to show for all that time. I haven’t given up, but it was time to work on something else. Crocheting is easy for me, and the library has some wonderful books on the subject. Crochet edgings and flowers would be lovely on crazy quilt blocks, so out came my teeny tiny metal crochet hooks and sewing thread. You can probably guess by now that all did not go well. Sunday’s crochet efforts yielded absolutely nothing. Monday – the start to a new week – and my favorite day of the week – yes, I’m nuts, nobody likes Mondays except for me – I tried the crocheted flower again. Success – sort of. I was able to make the motif, but I didn’t like it with the variegated thread. You know what? I was thrilled. I was able to crochet the motif with thread and the small crochet hook, and I learned that variegated thread wasn’t a good idea for this type of design. Mistakes are valuable learning experiences as far as I’m concerned. I really liked how these motifs sewed out and being 100% silk, I’ll be able to dye them any color I like. Happy Days again!!! I got my fiber mojo back!!! It’s going to be a good week. No more suspense. My new quilting love is crazy quilting. There are no rules, no points have to meet, you can use all sorts of fancy fabric, trims, buttons, embroidery and the embellishments – oh my, the embellishments. Crazy quilting has it all – it can be understated with elegant seam embroidery, it can be glitzy with lots of beads and sequins, and my most favorite version of all, it can be encrusted. Encrusted crazy quilting is more of everything!!! The base fabric shows – barely. The embellishments are front and center. My aim is to create an encrusted wall hanging for Valentine’s day of 2009. Then who knows what next will capture my interest. 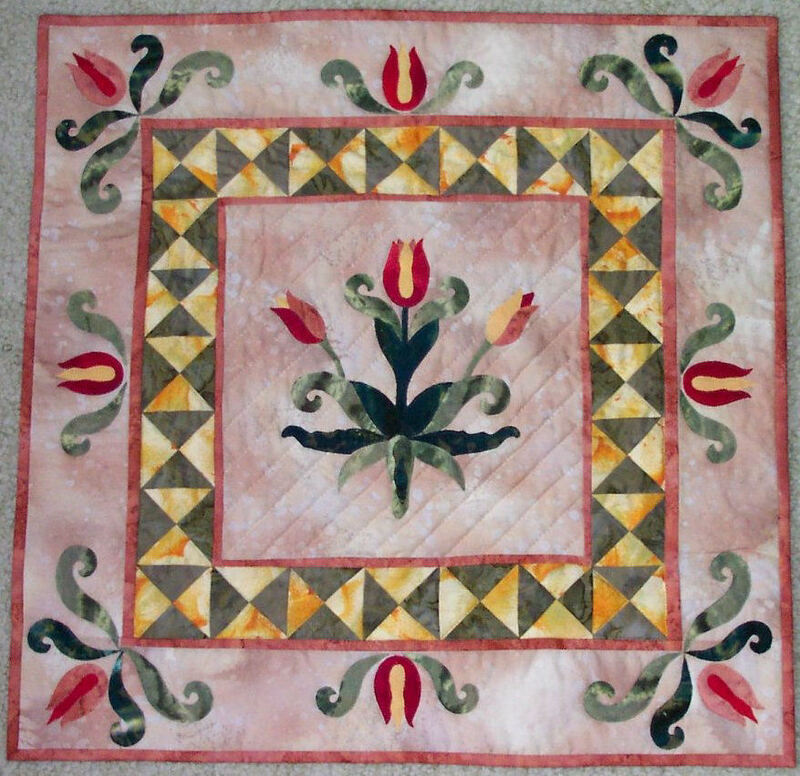 Quilting has so many different aspects. This is a textile art that can be explored for a lifetime. Making art quilts is my current quilting focus. My very first piece was made for the Memorial Art Gallery show held earlier this year, and lo and behold, it sold. My very first art quilt sale. I was ecstatic. This was an invitational show and I was honored to be asked to participate. It started with visiting the gallery this past summer to select a piece from their collection as inspiration. The Impressionist style of painting has always appealed to me, so I selected one from that style and had a wonderful time making my piece. 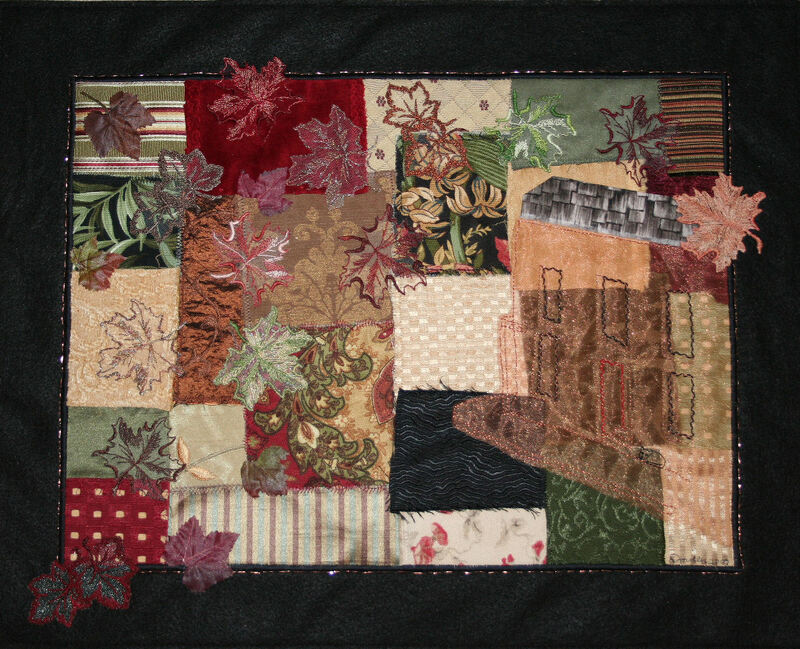 A collage of upholstery fabric was used as a base for the machine embroidered house I sewed out separately on metallic organza. I hand embroidered around each window and door to highlight and add texture to the embroidery. 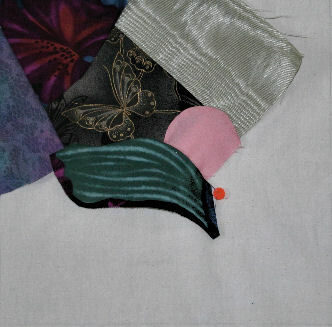 Each piece of the upholstery fabric base had a different decorative machine embroidery stitch sewing it in place. My sewing machine was used extensively for this project. Next, numerous machine embroidered leaves were appliqued by hand over the surface. They were made on various colored tulles and sheers, using a wide variety of threads – rayons, cottons, metallics, silk, and variegated. Additional silk flower leaves were added, and an embroidered cat was added for the house doorstep. The entire piece was attached to 2 layers of black felt to act as a frame. They were stitched together with copper wire. My poor fingers will testify to that material being real copper. The finished piece is 18′ x 22″. But there is another aspect of quilting that has captured my interest this year. I’ve managed to find a new love. More about that in Part III. 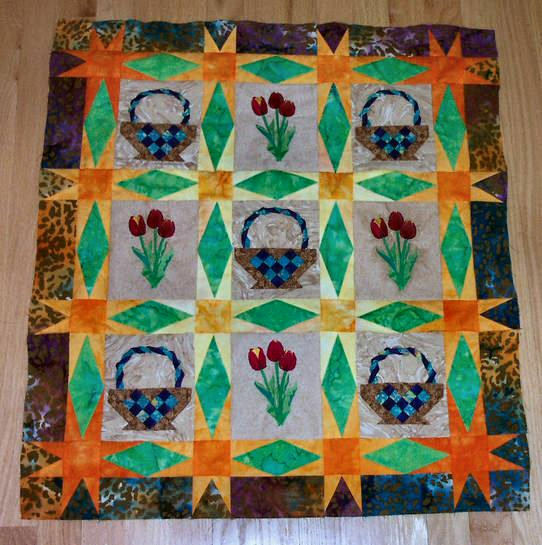 Quilting is a long time passion of mine. Since 1976, I’ve made over 100 bed quilts – some for personal use, some to sell, and some Comfort Quilts for donation. Wall hangings came next. There is a little area over a kitchen desk and I thought it would be nice to look at some of my fiber art every day. Thus the concept of a different small quilt for every season. Spring is here, so the little tulip wall hanging is up now. A few months ago, I was visiting my Aunt and her apartment entry way looked awfully plain, so I asked her if she’d like some small quilts for her front door also. I purchased another magnetic rod for my Aunt and hang quilts on her door now too. She really likes looking at a quilted wall hanging instead of a metal door, and so do her visitors. Part II of my quilting journey will be tomorrow’s post. So stay tuned. There is more to come! Yesterday was the monthly GVQC meeting and our speaker was Lura Schwarz Smith. What an impressive body of work she has created. She is a prolific, gifted fiber artist, and an entertaing speaker. Her one hour lecture flew by. After the meeting, I went shopping at JoAnns, Etc. Blue Moon beads were on sale and I spent a pleasant couple of hours chatting with a fellow bead lover as we selected our purchases. Then on to the fabric and clearance bin where I found some wonderful fabric – all 50 to 60 percent off. As I was checking out, people saw my cart contents, and quickly moved to another line. 😉 What can I say? I had very good shopping karma yesterday. Here is a picture of some of what I purchased – the embroidered silk doupioni was from last week’s shopping trip – but I promised the readers on the Yahoo crazyquilterinterational group to post a photo of it. My April TIFC piece is finished. It was totally composed in Paint Shop Pro and went through 3 different looks. I focused on the concept of change and liked the idea of documenting the recent changes in aviation – probably because of the copyright free photos available on the internet. The first version had the space shuttle in the middle and all the older planes around it. I edited the photos, framed them and placed them around the shuttle, connected by blue woven trails on a grey, crumpled background. The black and white photos looked great against the grey, and I liked the woven blue trails, but the arrangement wasn’t quite right. Onto the second version – between resizing, mirroring, using different filters and arrangements, the planes became unrecognizable. I didn’t even save any of the working files from the second version. Finally, the third version was the winner. These are mostly black and white photos, so I thought it would be fun to frame them with an old fashioned film strip look and elimnated the space shuttle. This picture is small in my blog, but the first plane is from 1943, then onto 1945, an Elvis Era plane is next and then a plane from the present. It struck my funny bone to see a plane on NASA’s website labelled Elvis. This isn’t fiberly, but it is my finished April TIFC and I wanted to post it as I’m part of the TIFC web ring. 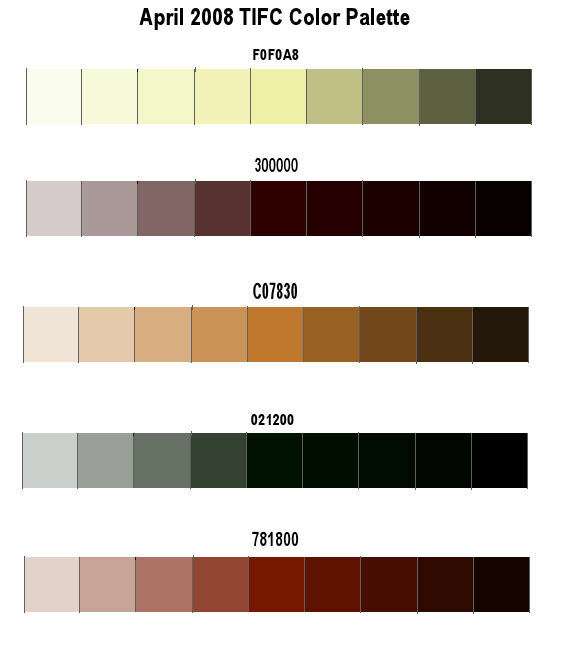 This morning I created the color palette for April’s TIFC piece. It’s free for anyone who would like to use it for the challenge. The concept idea of change is intriguing though and that will be my focus for this month’s challenge. Warmer weather has finally arrived. 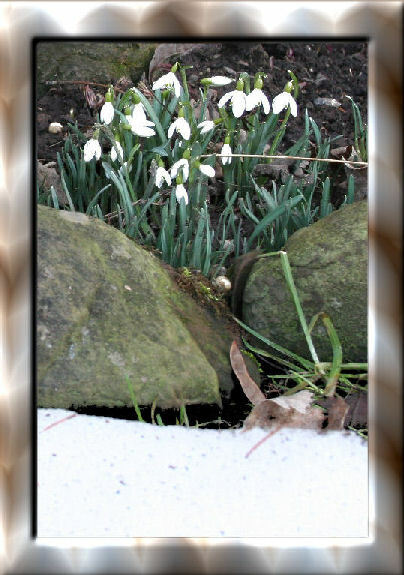 The first flowers of the year have opened – snowdrops – amid the snow – visible in the bottom of the picture. The bulbs were given to me by a dear neighbor who moved to North Carolina and every year when they open up, they bring back the fond memories of good times we shared, and the promise of Spring. Happy Days!!! 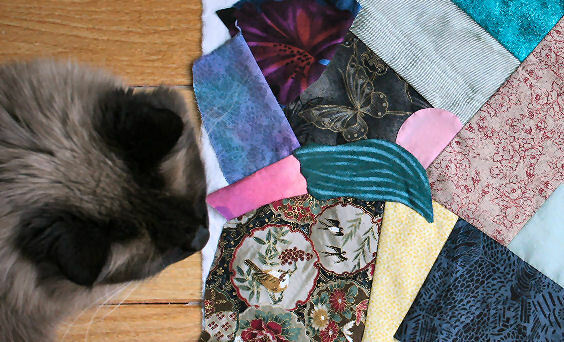 Coco (my cat) is much better and I stayed up till 1 am piecing the crazy quilt block for the Fabulous First Timer Round Robin. Here is a picture of both the block and Coco pursuing her full time position of quality control expert. 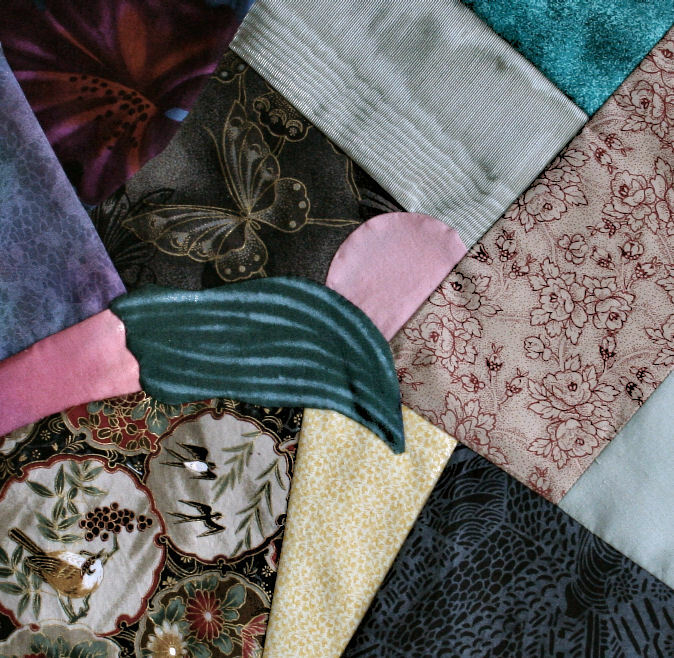 There isn’t a lot of silky type fabric in this block as most of what I own is for “sane” quilting – lots of 100% cotton. Future shopping expeditions will be focused on locating velvets, silks, and assorted fancy fabric. Oh, I like that idea – shopping for fancies. Something about that phrase is very appealing. No Rochester Area Fiber Art Group meeting for me Thursday. Instead I awoke to my cat being violently sick. She needed to go to the vet, then admitted to their hospital. After having an xray, ultrasound, bloodwork drawn, and IVs, she’s still pretty sick, but purring, so I’m poaching chicken tenderloins for her and hoping she’ll be able to eat some today. To keep myself distracted yesterday, I started working on a new project. I’m a member of the Yahoo group CrazyQuiltingInternational (crazyquiltinginternational-subscribe@yahoogroups.com), and those artists are an extraordinary group of people. Their embroidery skills are amazing, their sense of humor is unparalled, and they are nice to boot. I have no clue if I’m getting myself boxed in – piece wise, but I’m pretty sure I was supposed to start from the bottom and work my way to the top. Of course, I started from the top and am working my way to the bottom. I’m not dyslexic, but I am geometrically challenged. Here’s a picture of it cropped so you can see the actual size it will be (10″) and how the edges are nicely cleaned up. 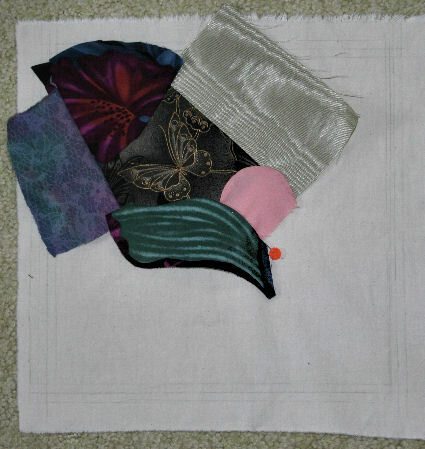 Today, I hope to get a lot more of it pieced and will post a picture when it is completed.